Also known as the "Twelfth Day" or the "Three Kings Day," Epiphany falls on the 12th day of Christmas and is the day that the Three Kings or the Magi visited Jesus. It is the day that Christians celebrate the revealing of Jesus to the world, usually through the Kings. There are also other ways that Jesus revealed himself to the world through the years and those can also be celebrated on Epiphany. Why does this matter on our Kansas ranch? Well, the first reason is that I don't take down our Christmas decorations until after January 6. Of course, we also don't put them up early...while many people put their trees and decorations up on Thanksgiving or near that holiday, our family is very busy feeding cattle and dealing with the crazy life of cold weather ranching. I also have an annual state livestock association meeting the first week in December that I have attended for many years and is a priority in our family. So it is frankly difficult to get the decorations up that early! So we wait until closer to Christmas to put our tree up. Also, many people don't realize that the Twelve Days of Christmas actually start on the day of the Nativity, or Christmas Day of December 25. So count twelve more days and you have Epiphany! I have blogged about the 12 days of Christmas before...the links are below for Christmas on the Ranch. On the First Day of Christmas, my true love gave to me...a Cow Dog to work beside me! On the fifth day of Christmas, my true love gave to me...five awesome kids! On the twelfth day of Christmas, my true love gave to me....twelve Kansas sunsets. My family doesn't necessarily feast on Epiphany, but we do celebrate the Three Wise Men in other ways. At Christmas, each person in our family receives three gifts--the same number Jesus received from the Magi. Santa brings each person one gift, and two are from Mom and Dad...the best present is always from Mom & Dad (might as well take credit for the good stuff!). Remember, we have five kids and it can be overwhelming to purchase a huge number of gifts. Keeping the list to only three per person, makes us more thoughtful in our gifting and teaches the kids to enjoy each of the packages they receive. In addition, our kids have always drawn names to purchase gifts for each other. We considered having them purchase for all four of their siblings, but that seems silly--especially when as little kids, Mom & Dad often do the purchasing! So they draw names around Thanksgiving time and they have quite a bit of time to find the perfect gift for their sibling. On Christmas morning, this the present they open first! We sit around the room, snuggling in blankets and the new PJs that they got on Christmas Eve and watch as each kid opens the present from their brother or sister and says thanks immediately! It has evolved into a tradition that they really enjoy--and it warms my heart to see them enjoy what their sibling found for them. I also love making Christmas gifts. I often make a huge portion of the gifts we give to family and one of the most appreciated gifts to grandma and grandpa was a collection of pictures of the grandkids...I blogged about that one too! Homemade Christmas!! Christmastide is nearing an end and our celebration of the birth of Jesus, but one goal I always set at the beginning of each year is to keep Jesus in my heart throughout the year. I usually fail at this, but it is an ongoing journey that I believe God understands. Afterall, He made me and understands my failings. He also knows my heart and that I truly want to be more like Him. So, keep the season in your life during 2014 and enjoy the last day of Christmastide. Celebrate the 12th day of Christmas and the arrival of the Magi at Jesus' manger-cradle. 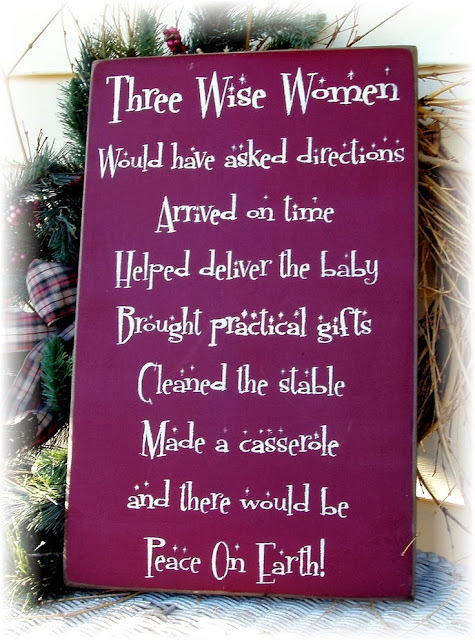 On Christmas Eve, our minister read a funny poem he has in his office and I wanted to share it with you....so, here is the Three Wise Women!